The Alternative Hair Show that will take place in October at the famous London Royal Albert Hall, one of the most important and prestigious charity events in the hair world, this year will celebrate its 30th edition. 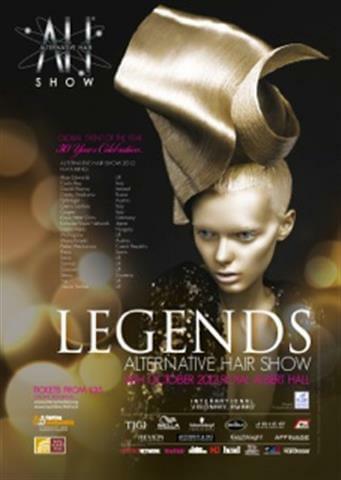 To celebrate this important event and all hairstylists who have left their mark in the hair fashion world over the years, the title of the show 2012 (International Visionary Show) will be named “Legends”. On this occasion international hairdressers will put on show their best interpretations of the many world famous hairstyle creations by these reputed icons of the Hair World; special commemoration will be given to Vidal Sassoon who sadly passed away last May. Among the international well-known sponsors who, for years, have been supporting this charity in favour of Leukemia and Lymphoma Research, founded by Mr. Tony Rizzo in 1983, this year, for the first time, will have at their side a well known Italian company called Parlux. This Italian company, the only Italian sponsor, world-famous for their professional hairdryers, especially the Eco-friendly models that have been created to protect the environment, has now decided to dedicate time and energy in supporting this very important and delicate social issue.